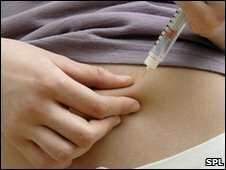 Scientists in Cambridge have shown that an "artificial pancreas" can be used to regulate blood sugar in children with Type 1 diabetes. A trial found that combining a "real time" sensor measuring glucose levels with a pump that delivers insulin can boost overnight blood sugar control. The Lancet study showed the device significantly cut the risk of blood sugar levels dropping dangerously low. Experts said the results were an important "step forward". Type 1 diabetes is a chronic, life threatening condition, in which the pancreas does not produce insulin - the hormone that regulates blood sugar levels. In total, 17 children and teenagers with Type 1 diabetes took part in the study over 54 nights in hospital. Individually, the glucose monitoring system and the insulin pump used in the study are both already widely used and commercially available. But in order to turn them into a "closed loop" system which monitors the patient's condition and delivers treatment accordingly, the researchers developed a sophisticated algorithm to calculate the appropriate amount of insulin to deliver based on the real-time glucose readings. They then measured how well the artificial pancreas system controlled glucose levels compared with the children's regular continuous pump, which delivers insulin at preselected rates. Testing was done in different circumstances - for example on nights when the children went to bed after eating a large evening meal, which can lead to 'insulin stacking' or having done early evening exercise - both of which can increase the risk of low blood sugar episodes known as hypoglycaemic attacks or "hypos". Overall, the results showed the artificial pancreas kept blood glucose levels in the normal range for 60% of the time, compared with 40% for the continuous pump. And the artificial pancreas halved the time that blood glucose levels fell below 3.9mmol/l - the level considered as mild hypoglycaemia. It also prevented blood glucose falling below 3.0mmol/l, which is defined as significant hypoglycaemia, compared with nine hypoglycaemia events in the control groups. Study leader Dr Roman Hovorka said: "This is the first randomised study showing the potential benefit of the artificial pancreas system overnight using commercially-available sensors and pumps. "Our study provides a stepping stone for testing the system at home." Karen Addington, chief executive of Juvenile Diabetes Research Foundation, who funded the research said the study provided "proof of principle" of an artificial pancreas. "We need to redouble our efforts to move the artificial pancreas from a concept in the clinic to a reality in the home of children and adults with type 1 diabetes." Dr Victoria King, research manager at leading health charity Diabetes UK, said: "This is an important step forward in managing overnight blood glucose levels as well as in the eventual development of a full 'artificial pancreas' which could vastly improve the quality of life for people with type 1 diabetes and reduce the risk of the associated complications."